I have never been to Nantucket. It is a long way from Yorkshire. Would I like to go? You bet - it looks like a heavenly place and who doesn't love the seaside and quaint streets and little boats and beautiful houses. I have been lucky enough to visit Newport, Rhode Island, so I guess I have had a taste of what it might be like, but since working on this project, it is definitely on my bucket list. For now though, this quilt will have to suffice and it is not hard to be happy when you see it. Camille Roskelley of ' Thimbleblossoms' designed this quilt pattern after a visit to the island and it is every bit as lovely, as I imagine Nantucket to be. It was just one of those moments....When I saw this quilt on the Thimbleblossoms instagram feed late one evening, I was totally and utterly smitten and ordered the pattern there and then. I had seen it before, as it is not a really new pattern, but this time it was made in Bonnie & Camille's 'Basics' collection of fabrics and it looked absolutely amazing. I knew I had a stash of appropriate fabrics, so as soon as the pattern arrived, I set to work. As you know, I love to design quilt patterns, but I also enjoy making up other designers patterns and especially ones with a new technique that is fun to learn. This one definitely fell into this category. Camille Roskelley specialises in easy to follow designs and there are no awkward Y seams involved in these blocks. Even so, making the pieced diamonds was something new for me and I have to say, although it is straightforward to do, it is quite hard to keep the edges from stretching and to make the block fit together. I am a precision cutter and a careful stitcher and rather keen on perfect points....but it is just never that simple. After making a few blocks - they all seemed different in some marginal way or other. I think the best approach to this quilt is not to be too obsessive. I say that, because when it is finished...all those minor imperfections will disappear into the sheer beauty of the quilt. I haven't quilted it yet. My sewing machine has gone to the Janome Spa for some pampering .... I do use it everyday and it needed a check over....however, I may be prone to tremors in my hands until it is back. I haven't even decided on a backing for this project yet, but I am absolutely convinced that once it is finished - it's going to be a cracker!!!! This quilt is not for the fainthearted, the perfectionist or the beginner, but it is incredibly lovely and what is more, it is going to perfect for lazing with in the summer sunshine and dreaming of Seaside days in Nantucket! Oh and PS. 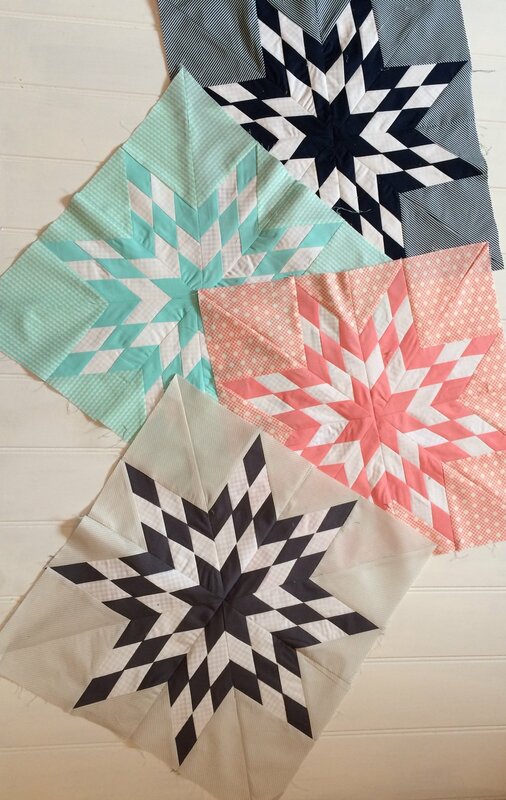 There are some really pretty 'Jimmy's Windmill Quilt Kits' now available in my Etsy Shop.